Shopping for the men in my life is my biggest struggle, even more so with the fact that before we are even 40 days into the new year I'll have to get birthday presents for all of them to boot! Thankfully Sean helps me out with this guide now so hopefully some of these will be spot on for the men in your lives. The Leatherman multi tool is one of Sean's top picks, and he felt it was also important that I mention it comes in stainless steel and matte black as well as the green, which is my preference of course! The leather bag is actually a leakproof cooler, which has to be the most stylish way I can think to cart around your food and drinks. I read one review of the mini wireless projector and was convinced I needed to include it on this list - wouldn't being able to project a movie anywhere you go just be so much fun? 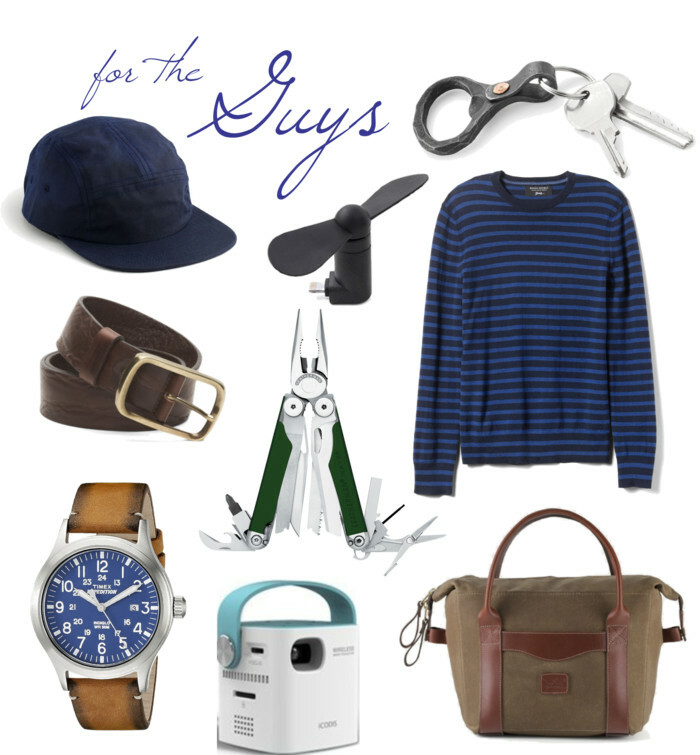 That multitool is a great gift idea!! I love the projector too! My husband has one of those multi tools and loves it. Great ideas! MY new love for men is watches! I have found some AMAZING ones at TJ Maxx too this year, I almost think that those are overlooked because men don't shop there as much! When it comes to shopping for the men in my life, I have to say that I consider myself very lucky that my family doesn't go in much for gifts, much less surprise gifts, or I would never know what to get anyone. The mini wireless project is quite brilliant though, I must say! The multi-tool and the projector look really cool. Shopping for guys is pretty hard. However I picked up a brown very belt to the one you picture. Men can be so tricky to buy for! I love that cooler though! What a neat gift idea! So many great options, thanks Lydia! I love the idea of the mini wireless projector!! That's a new and good one!